Does your organization have an online store, or are you considering setting one up? If so, you’ll know running a store can take a lot of time — there are product details to be uploaded, orders to be fulfilled, and payments to be collected. Even so, many organizations find that their online store can be a reliable way to raise funds and spread their message all year round. 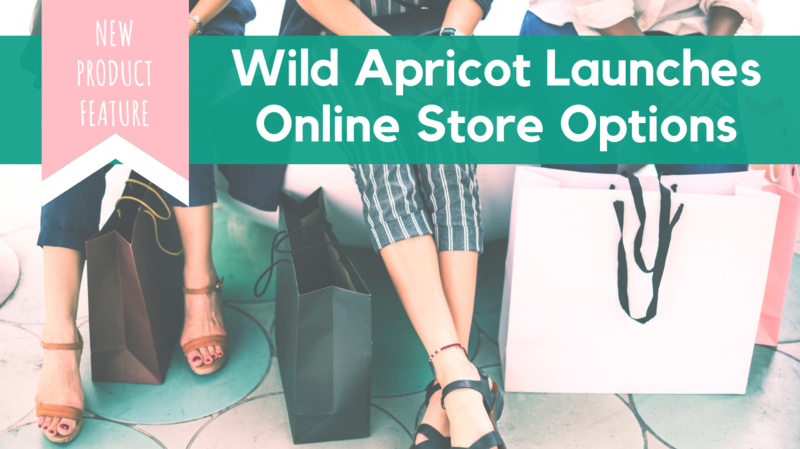 To help cut the time it takes to manage your online store each week from days to just a few hours, we’ve introduced four new features to the Wild Apricot Store module. These features mean you can spend less time uploading products and processing orders, and make it easier to track payments and taxes. Since we added the Store module to Wild Apricot in April 2018, many of our customers have been selling products, vouchers and services via their online stores. Your feedback in the Wishlist Forum has helped us continue developing this module, and we’re delighted to launch four enhancements you’ve told us will help you make the most of the Store module. Add multiple variants for each product on your online store, such as adding options for colors, styles, and sizes. Limit the stock available for each variant, so people won’t be able to continue purchasing them after you’ve run out. Choose whether customers can pay for products offline or online, or both — whichever is the best fit for your organization and customers. Add taxes on to each purchase, rather than having to factor them into the product price. You can add one or more product options – like different sizes or colors – to create multiple product variants (like Small, Red or Medium, Blue). Go to the Products section of the Store module and select the product to which you want to add variants. Click the Add option button under the section heading Variants. In the Option name field that appears, identify the option you are adding (e.g. Size), and in the Option values field, enter the choices available for that option, separated by a comma (e.g. Small, Medium, Large). When your customers are viewing this item on your online store, they will be shown a drop-down menu for each option on the Product details screen, as below. This uses the Option name as its label and the Option values as the available choices in the drop-down menu. Here, you can choose whether you want to specify a stock quantity, so you can track inventory and cut off sales after your available stock has been sold. Go to the Products section of the Store module and select the product that requires an inventory limit. Scroll down to the Inventory policy option and select Track inventory from the drop-down menu. If you have product variants set up, specify the stock quantity for each individual variant in the Variants section (as below). If you have no product variants, you can enter the stock quantity for the product in the Stock field. In the Product list, the total quantity of stock still available will be shown for each product. If you haven’t specified a stock quantity, it will be shown as Unlimited. As customers purchase your products, the stock quantity will be automatically adjusted to indicate the remaining quantity. On your online store, the available quantity left in stock is displayed on the Product details page for each item. If there are variants available, the available quantity is displayed after the customer has chosen their options. You can now choose whether to accept online and/or offline payments for orders from your association or nonprofit’s online store. The online option is only available if online payments have been enabled for your site. Click the Settings tab within the Store module. In the Store settings screen, scroll down to the Payment methods section. Here, you can select which payment setting you would like to use. If you are shown a message stating that ‘You’re currently accepting offline payments only”, click on the Payment settings link and follow the instructions to add an online payment option. If only offline payments are enabled, an Invoice me button will appear when the customer proceeds to checkout. If the customer clicks this, an invoice will be emailed to them, and the customer can then pay your organization directly, for instance via cash or check. If only online payments are enabled, a Pay online button will appear when a customer proceeds to checkout. Clicking the Pay online button will take the customer to the online payment screen for your site's payment provider, where they can pay the store invoice. If both online and offline payments are enabled, both buttons will be displayed: Pay online and Invoice me. With the release of Version 6.10, you can now apply sales tax or VAT to online store purchases. In this initial implementation of taxation support for the online store, you can choose whether to apply the default tax settings to online store purchases. You can do this within the Tax scope section of your site’s tax settings. Go to the Finances module and select the Taxes tab. Add the name and rate of any taxes you need to apply in the Tax rates and policies section. You can also choose whether taxes should be included in the total price, or added to the total price during checkout. Scroll down to the Tax rules section. Select which of the taxes you would like to apply. Scroll down to the Tax scope section. Select which payments taxes should be applied to: Membership invoices, Event invoices, and/or Online store. At the moment, you cannot override the default tax settings based on the purchaser's location. If you need the ability to override the default tax settings, so you can charge different rates based on the purchaser’s location, click here to add your vote to the Wishlist request for this feature. With taxes enabled for the online store, your customers will see a separate line entry for the tax in their shopping cart. The taxes added will also be shown on the confirmation screen when they go to checkout, and If they choose to be invoiced, the taxes will appear on the emailed invoice. How many variants can I add to each product? You can add up to three options for each product. For example, if your product was a shirt you might include options for size, color, and a choice of regular or slim fit. You can add up to 10 values for each option, e.g. as your variants for color you could offer red, orange, yellow, green, etc. There is a limit of 32 characters for the name of each value. Can I add shipping costs to an order? This is not currently possible using the Store module. We are working on developing a function that will add shipping costs — you can track the progress of this feature on our Wishlist Forum by clicking here. For more detailed instructions on how to use these features, and for information on how to set up your own association or nonprofit online store, visit our Help Site page on setting up an online store, or see our post on A Sneak Peek at Wild Apricot’s Online Store. If you have any questions, or need help setting up your online store, feel free to contact our support team. What about selling raffle tickets? Hi Margaret, While we don't have anything specifically set up for raffle tickets, you could certainly use the online store function to sell them.